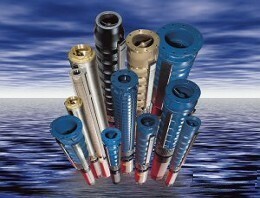 Turoteknikk can offer submersible pumps for all applications. Many of our pumps are designed specifically for solids handling and incorporate several engineering features that prevent jamming and clogging, the two most common problems in pumping fluids containing solids. They can be supplied with cutter systems, vortex impeller or channel type impeller. 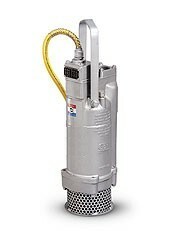 HS series hydraulic submersible pumps are designed for trash-handling, dewatering applications and for pumping dirty liquids such as mining and paper plant wastes. 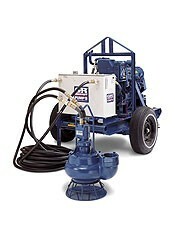 They are also excellent for pumping sewage from digester and holding tanks as well as sewer bypass. Because they operate without using electricity, they are well suited for applications where electricity is hazardous. For drilled wells, narrow cofferdams and hard-to-reach places, Slimline drainage submersible pumps are light and easy to handle. BOREHOLE PUMPS - Indespenable for lifting water from small diameter deep wells; these pumps are suitable for many types of application which include general industry, municiple water supplies, mining, irrigation etc. Also commonly uses for public fountains and water features.